Recently, I had the great pleasure of interviewing Moira McLaughlin, an artist and blogger living in California. A selection of Moira McLaughlin’s work is displayed below. Please visit Moira McLaughlin’s website and Etsy shop to view more of her work! MOIRA MCLAUGHLIN: Before she became a wife and mother, my mom was an art teacher. She encouraged my three sisters and me to be artistic right from the start. We were raised in Cleveland, Ohio with frequent visits to the world-renowned Cleveland Institute of Art. And our extended family lived in New York, so yearly visits to the Met, MoMA,and the Guggenheim were common. At Christmas, we always got fresh boxes of crayons, sketchbooks, and magic markers. I never chose to be an artist. I just was always surrounded by art. I thought that was normal. MOIRA MCLAUGHLIN: I don’t have a fine art degree. I have a BA in history with a film studies minor from Boston College. But, since the age of five I’ve taken art classes. And during college, I spent year in Italy studying art history, photography, and Italian cinema. While abroad, I visited many museums in Europe and viewed many of the masterpieces of the western world first hand. It’s been unconventional and awesome. KATHERINE CARVER: Can you describe the time when you first realized that making art was absolutely something that you had to do? MOIRA MCLAUGHLIN: I don’t think I ever felt that way. In fact, I’ve always wanted to invent something more than I’ve wanted to be an artist. I consider myself more of an “art entrepreneur” than an artist. Part of this resistance stems from not liking to have a lot of things. I’m a minimalist. I like paring down. So making things, even making art, stresses me out. That’s sparked my interest in looking at art not as something artificial, separate from nature, but something organic, created in collaboration with nature. I’ve become interested in environmental art and biodegradable houses. I find the beauty of a perfectly stacked woodpile really exciting, and I’ve become obsessed with collecting sticks and building teepees. And, to be totally honest, when I watch documentaries of artists working in sterile, white studios, with store-bought paints and canvases, it looks depressing to me, not something to aspire to. I feel very conflicted about much of the “art world” today and my relationship to it. The industry is not sustainable. 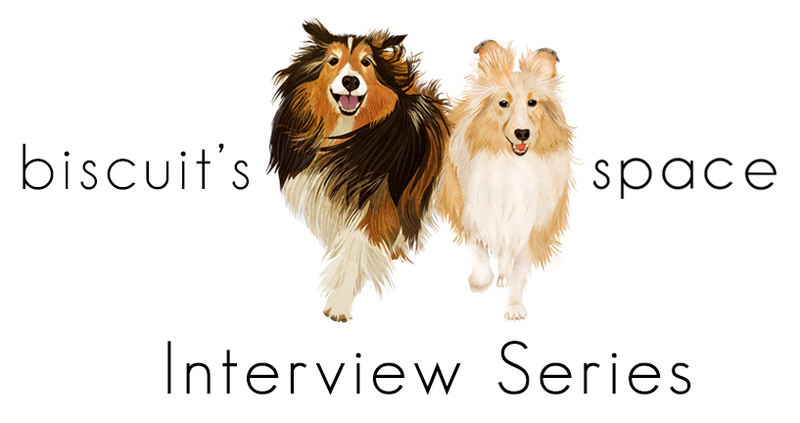 KATHERINE CARVER: What was the impetus that inspired you to begin painting and making art of dogs? MOIRA MCLAUGHLIN: In 1999, I became very sick after working in a building that I later found out was built on a toxic landfill. I was diagnosed (and still struggle) with chronic fatigue, fibromyalgia, multiple-chemical sensitivity, low thyroid, and an autoimmune disorder that affects my eyes. By 2005, I had no job and very little money, so I decided to make handmade gifts for Christmas. 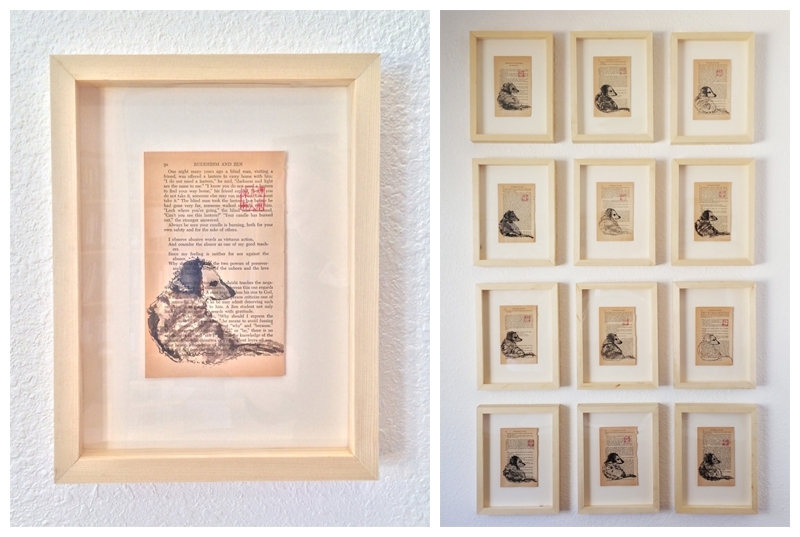 Everyone in my family owned a dog, so I made custom collages of each pet and framed them with $5 Ikea frames. They were a big hit. I made some more and posted them on ebay. They sold. And I became a dog artist. 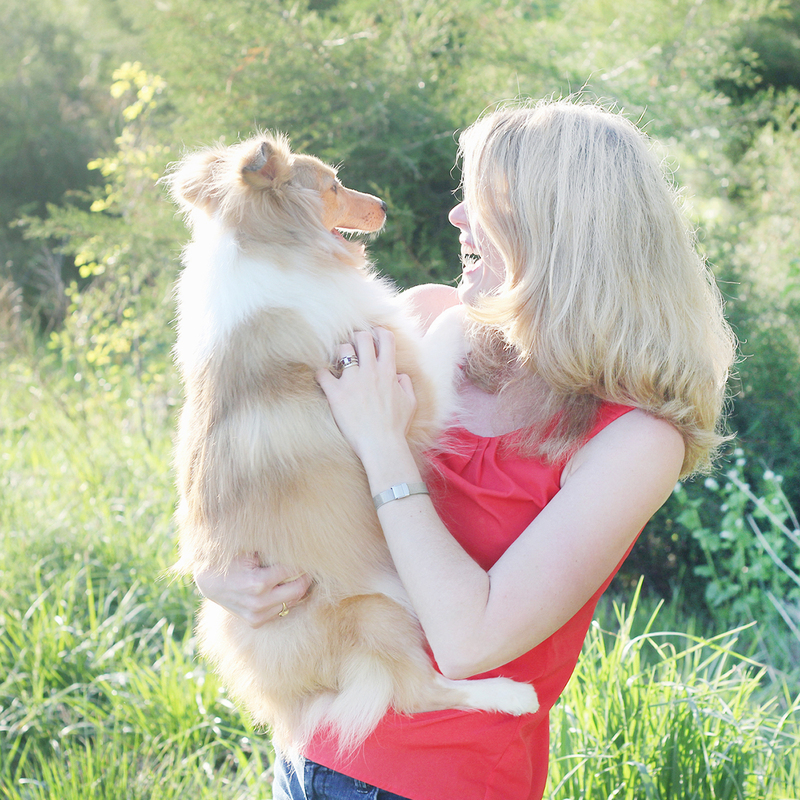 KATHERINE CARVER: What was the inspiration to begin your blog, Dog Art Today? MOIRA MCLAUGHLIN: By 2007, I spent most of my time in bed, very sick and in chronic pain. It was very isolating. I started Dog Art Today as a way to connect to other people when I rarely left my house. 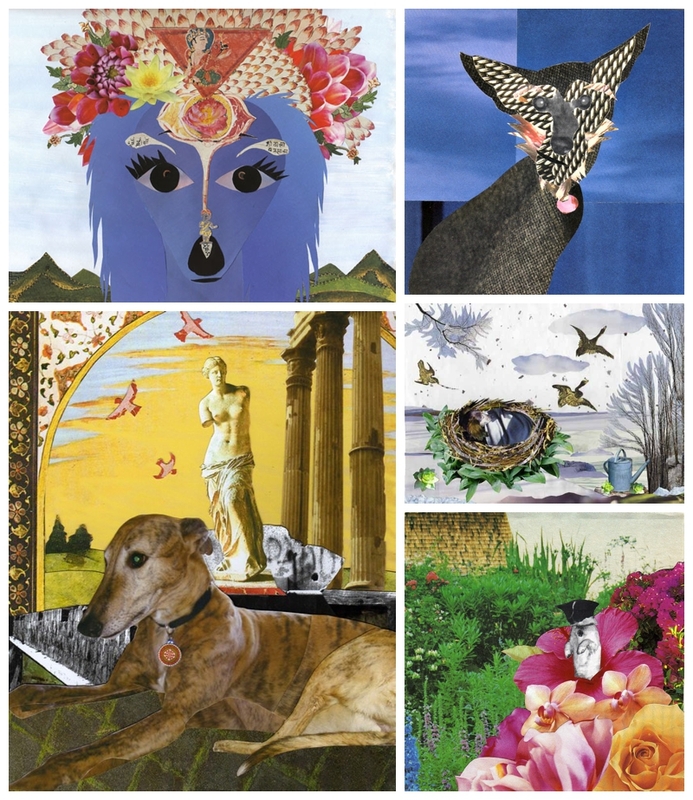 KATHERINE CARVER: How have your own dogs influenced your work? 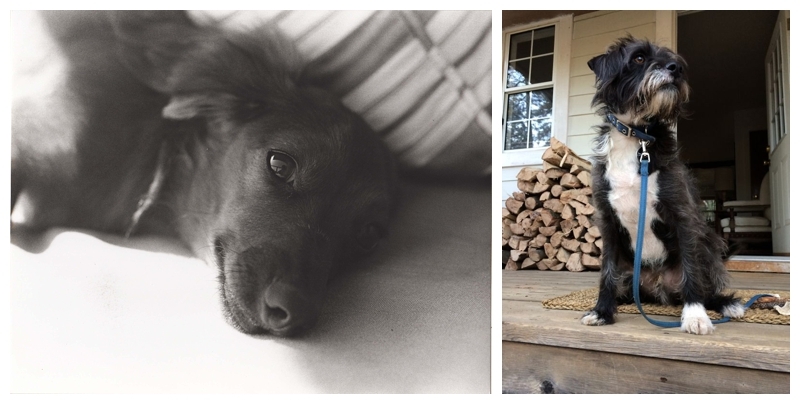 MOIRA MCLAUGHLIN: Darby, my Longhaired Dachshund who died at age 17, was a beautiful, soulful, and clever creature who constantly outwitted me. Tyler Foote, my mixed-breed Terrier, is a graphic, macho, survivalist. They both inspire my work. But even more so, their companionship allows me to enjoy solitude, which for me is necessary for creativity (and my health). 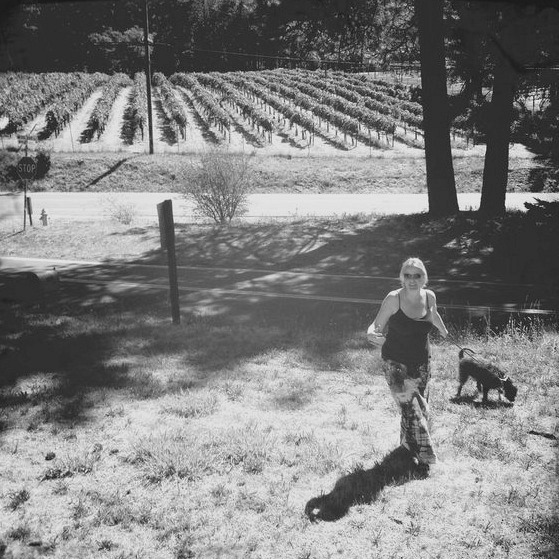 Most important are the walks; my best ideas happen when I’m walking my dog. Darby pictured above on the left; and Tyler Foote pictured above on the right. KATHERINE CARVER: Can you talk about your new work entitled, “dox-ZENs”? How did this body of work come about? MOIRA MCLAUGHLIN: After Darby died I was devastated by grief and creatively blocked. I made a few artworks, but soon got frustrated, angry that they weren’t good, like I wasn’t doing him justice. And I would just sob. So I shut my studio door a quit trying. A few months later, I discovered erasure poems on a wonderful blog that I think your readers would love called Gwarlingo. The poems are created by erasing texts of a book. I became fascinated with this subtractive, messy, experimental art form and started exploring my grief on the pages of an early 20th century spelling primer. Years ago, I had created a “dox-ZEN” collage, a generic image not related to Darby. So, later, when I spotted a book on my shelf entitled Buddhism and Zen, it sparked the idea of combining my new interest in erasure poems with a tribute to my own beloved dox-ZEN. One of the first concepts discussed in the Buddhism and Zen book, which I read as I deconstructed it, is that the mind is an endless process of three series: craving, acting and discontentment. It was the discontentment that was paralyzing me. So I decided to paint Darby in the exact same manner on every page. The art was the discipline, the meditation, not the outcome. I also looked to one of my favorite works, painted in 16th century Korea, for inspiration, Mother Dog and Puppies by Lee Am, 1507-1566. Around the same time, Jane O’Hara, a fellow dog artist whom I greatly admire, was putting together a group art exhibition entitled “Beasts of Burden.” She asked if I had something in addition to my “Dogs in Art” video (which was already included) to contribute. When I explained the “dox-ZENs” series she said yes. Having a deadline forced me to actually do it. It’s been extremely cathartic. MOIRA MCLAUGHLIN: My “Twelve dox-ZENs” and my video “Dogs in Art,” a three minute tribute to 5,000 years of canine art, will be in the upcoming exhibition, “Beasts of Burden” at the Harvard Allston Educational Portal in Allston, Massachusetts. March 13 – May 4, 2014. Visit BeastsofBurden.org for more information. 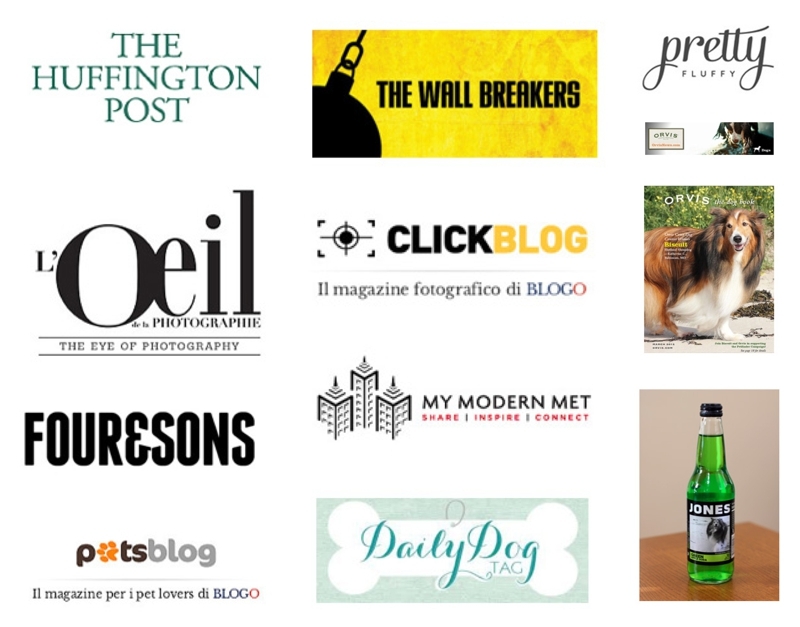 MOIRA MCLAUGHLIN: Navigating between the rhythm of blogging and the rhythm of making art. MOIRA MCLAUGHLIN: Lack of alternatives. MOIRA MCLAUGHLIN: Romare Bearden, David Hockney, Matthew Rose, Pearl Fryer, Patrick Dougherty, Louis CK, and Kenya Hara. MOIRA MCLAUGHLIN: We are living in a visual age. Realize that you have tremendous power. And don’t undervalue yourself. MOIRA MCLAUGHLIN: You can view my work by visiting the sites below. 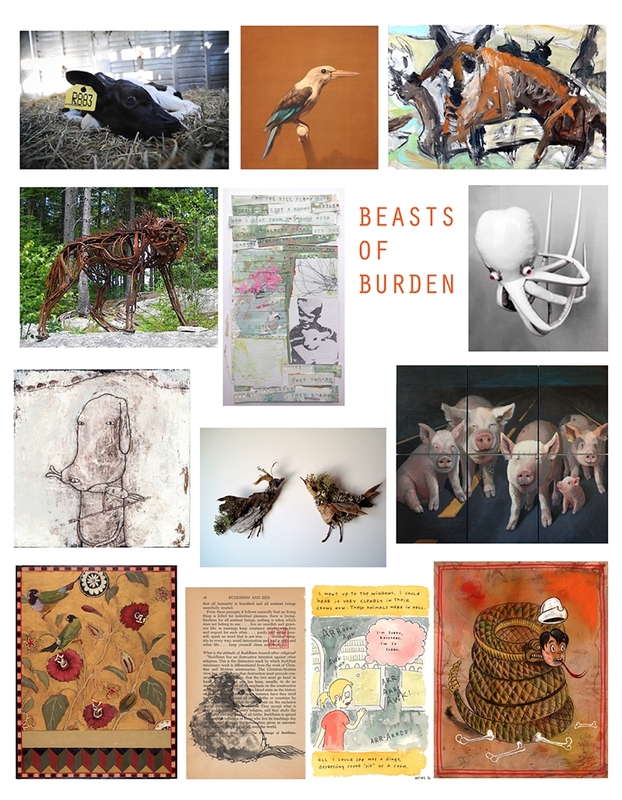 If you live near Boston, please come to “Beasts of Burden” at the Harvard Allston Education Portal from March 13 – May 5, 2014. Thank you, Katherine for including me on your wonderful website. All images contained in this blog post are courtesy of Moira McLaughlin.